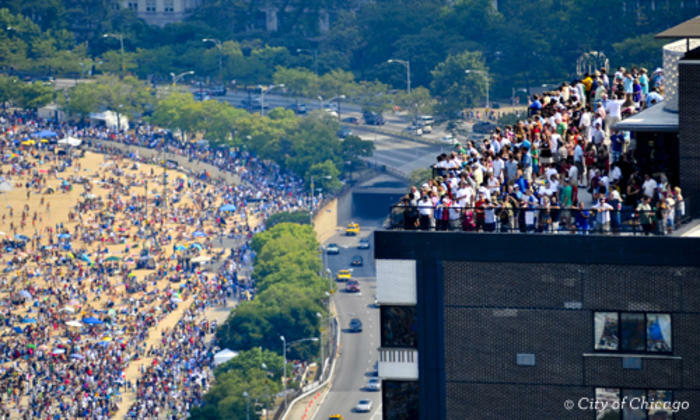 North Avenue Beach & Chicago Lakefront, August 17 – 18, 2019, Free Admission. Originating as part of a "Family Day Celebration" back in the summer of 1959, the Chicago Air and Water Show has grown to be the largest and oldest free admission air and water exhibition in the United States. The free, two-day event draws an audience of over two-million, spread out on colorful beach blankets and lawn chairs along dazzling Lake Michigan. Many camp out early, hoping to secure the best spots to catch the spectacular demonstrations by military and civilian aircrafts, boats, and diving and parachute teams. It&apos;s a thrilling, multi-sensory experience — soak up the sun, breathe in the crisp lake breezes and feel the rumble of jet engines soaring overhead. 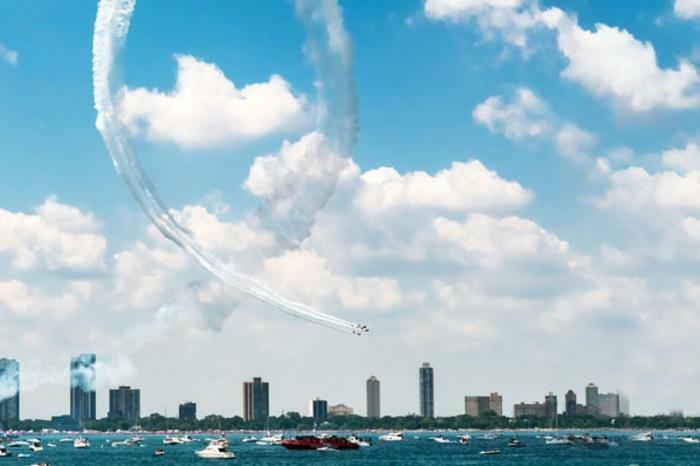 The 60th annual show, presented by Shell Oil Products U.S and the City of Chicago, will take to the skies and waterfront from 10am-3pm each day, with North Avenue Beach as the center point. 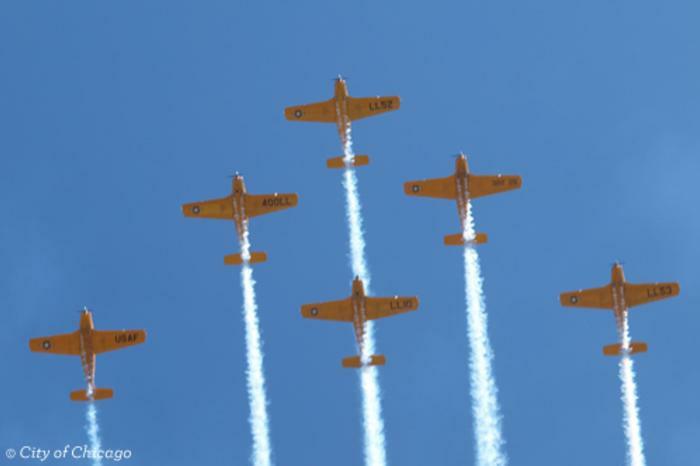 Get the full list of performers at ChicagoAirandWaterShow.us. While the program is the same both days, a schedule of performers is not set as pilots decide order and times on the day of the event. You can, however, count on the headliners performing last. Herb Hunter — "The Voice" of the show and a former pilot in the show himself — takes to the announcer&apos;s stand with his informative and entertaining play-by-play, so you&apos;re always in the loop. The prime viewing location for the Chicago Air and Water Show is at ground zero: North Avenue Beach from Fullerton Avenue to Oak Street. For a little more of the VIP treatment, grab tickets to the Shore Club (1603 N Lake Shore Dr), Guests will gain entry to Shore Club&apos;s patio with exclusive access to the restaurant, as well as Shore Club&apos;s signature beachside Brunch and premium open bar from 9am-2pm. VIP cabanas are available in The Shore Club Oasis as an upgrade in addition to the General Admission tickets. Tickets range from $125-$70. Castaways Bar and Grill throws a lively viewing party on the roof deck of its iconic beachside boathouse (now sold out). Visit the pop up Sand Bar Beer Garden, the only area of the beachfront where alcohol is permitted during the event,. Reserve a cabana space at Caffe Oliva for breezy, unobstructed views from Ohio Street Beach, or grab a spot on Oak at Oak Street Beach Food + Drink. Further north from the event but still close to all the action, other bustling waterfront spots at Belmont Harbor and Diversey Harbor provide more options down by the shore. As does the ever-popular Navy Pier and its Miller Lite Beer Garden. If you&apos;d rather get on the water yourself, take a special dining cruise aboard the Mystic Blue, Odyssey or Spirit of Chicago lines. Tour boats offer incredible views aboard their observation decks as well — try Wendella Boats, Shoreline Sightseeing Company, Seadog Ventures, Chicago&apos;s First Lady and Chicago Line Cruises. For a bird&apos;s eye vista, head up to 360 Chicago, formerly known as the John Hancock Observatory, where you&apos;ll be blown away by the 360-degree panoramas and the vastness of Lake Michigan below. Enjoy drinks from 1000 feet up in the Architect&apos;s Corner Café and Bar, or head below to The Signature Room at the 95th for its annual Chicago Air and Water Show viewing party. The Signature Room will feature a buffet of breakfast, lunch and dessert selections, an open bar and views of the show from the 95th floor of 875 N Michigan (formerly the John Hancock Center). Or enjoy a picnic in the sky with Skydeck Chicago. Lunch from The Goddess and Grocer will be served at Willis Tower VIP Style, 99 floors up from the second tallest building in the Western Hemisphere. With the package, you&apos;ll receive Fast Pass entry, reserved seating and admission to The Ledge, the thrilling glass-floored balconies on the tower&apos;s 103rd floor. Advance reservations are required! If you prefer an open-air environment, carve out a spot along a rooftop terrace, such as J. Parker at Hotel Lincoln and WET Deck at W Chicago Lakeshore Hotel. No matter where you are in the city, though, it&apos;s guaranteed you&apos;ll get goose bumps as the jets blast by. 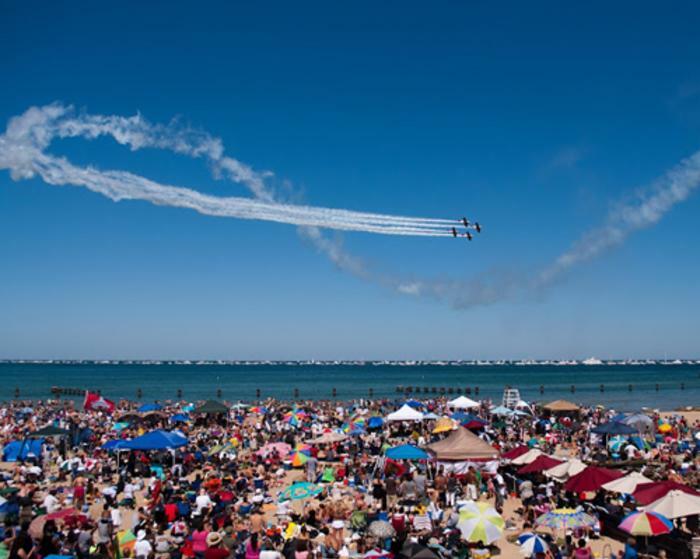 For helpful tips to plan your visit to the Chicago Air and Water Show and a list of frequently asked questions, visit ChicagoAirAndWaterShow.us. 1603 N. Lake Shore Dr.